Many of you have asked for clearer instructions on the method I use for separating the resin with its Boswellic acids from Frankincense in the post “Tapping into Frankincense and its Boswellic acids. An easy extraction method”. I realize written descriptions leave a lot of room for interpretation and a video would be the best method of demonstration. Since shooting some videos is still on my todo list, here is a photo progression of the process. I hope it offers the needed clarity until I get around to making a video. I also want to add here, though I name it “An easy extraction method”, easy is relative. It is also a messy and time consuming process. Be prepared to dedicate sieves, pots, pans and wooden spoons to Frankincense before you start, since cleanup is inevitable. Gird yourself with the knowledge that metal scouring pads and Olive oil followed by warm soap and water will eventually remove both sticky and brittle resins from most kitchen utensils and appliances. (And floors). Is it worth all the work? You betcha! 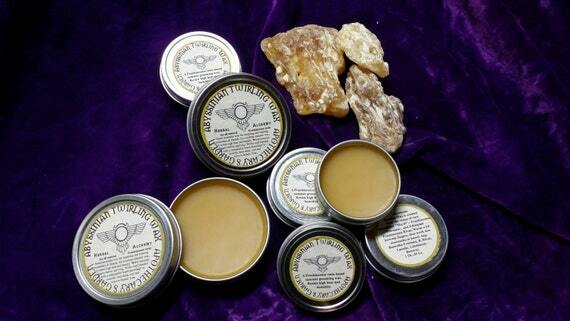 You will be able to make beautiful and efficacious oils, salves and cremes for medicinal and cosmetic applications. Products that deliver the full range of therapeutic compounds found in Frankincense including AKBA and the rest of the Boswellic acids. Products that deliver much more than the essential oil of Frankincense. I am sure there will be more questions, so feel free to leave them in the comments section below. Questions are good. Please note, this product is not meant to be taken internally. When I feel the need to take Frankincense internally, I take 1/2 to 1 level teaspoon 2-5 times a day of powdered fresh, whole Frankincense chased with water. Powdered Frankincense in gel-caps serves a similar purpose. remember everyone is different, what works for me might not work as well for you. If you want to try this, start small and listen to your body. This is a good opportunity to mention that the essential oil of Frankincense contains little to no Boswellic acids and is not suited for internal consumption. 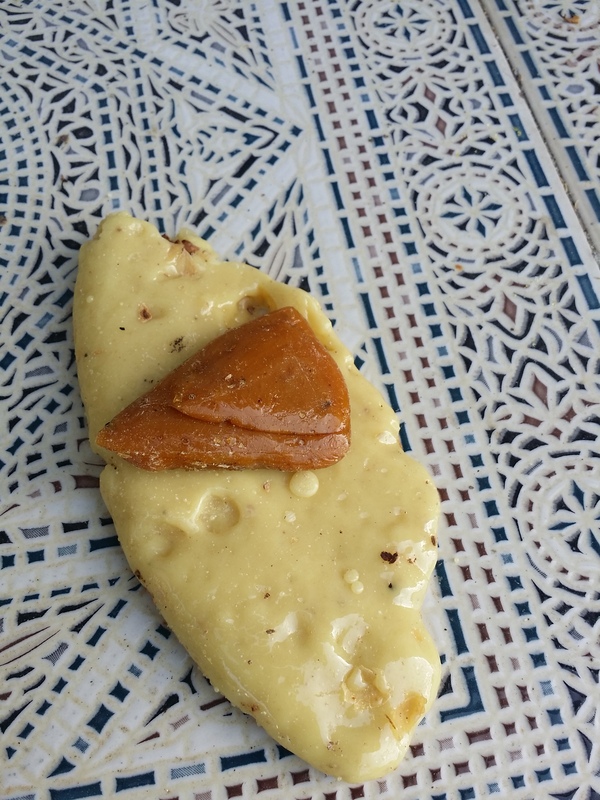 Here is a post showing you how to powder Frankincense-https://apothecarysgarden.com/2013/03/22/how-to-grind-frankincense-myrrh-and-other-oleo-resins/. Colander or sieve partially immersed in the water. The boiling water will dissolve the water-soluble gum and melt the resin from the bottom up. The gum will disperse in the water making it cloudy and the resin will float and pool on the water. Whole resin chunks of Boswellia Serrata in the sieve. No need to grind the resin or prep it in any way. The resin portion of Boswellia Serrata, B. carterii, B. Sacra and B. Papyrifera is mostly Boswellic acids. As many of you know, Boswellic acids have proven to be anti-inflammatory and anti-cancer in laboratory studies and are likely the main compounds that led to Frankincense’s long traditional use as medicine. There are no Boswellic acids in the essential oil of frankincense. Mid process, resin is floating on the water, Gum is clouding it and the fresh resin is on its way through the sieve. Stirring and pressing with a wooden spoon helps move the melted resin through the sieve. After processing, the debris in this case is mostly bark which I like to use as an incense material. Fresh Frankincense Serrata on the lower right. Resin frothing and floating on the boiling water. Set outside to cool, the resin begins to harden. The morning after, the resin has hardened. Some has fallen to the bottom since its specific gravity is close to that of water. It will sink in cold water and float in hot water. Running it through the oven at 220 degrees C. This releases and evaporates any water that is trapped in the resin as it cooled. Though the moisture will not interfere with the making of oils, salves and cremes, I prefer to remove as much of it as I can before storing it. Raw Frankincense on the left and Resin extract of Frankincense Sacra-Both heated to the same temperature. The lack of water-soluble gum in the extract means it will melt with heat and dissolve easily in warm oils and alcohol, while the raw resin will not. Solid at room temperature, the resin portions of Boswellia Thurifera beneath B. Papyrifera. Each species of Frankincense will yield a resin extract of different colour. Even variations in place or time of harvest can influence the colour of the finished product. As promised, here is the method I use for making a medicated oil from an extract of frankincense resin. Since writing the post on extracting Frankincense resin and Boswellic acids with water, a number of people have contacted me expressing difficulty dissolving the resin extract homogeneously in a vegetable oil. It is very important to follow the steps in the order they are laid out below. This method also works well when making a medicated oil using our local northern Pine, Spruce and Fir oleoresins which offer us an equally broad range of largely untapped, :-), therapeutic compounds. 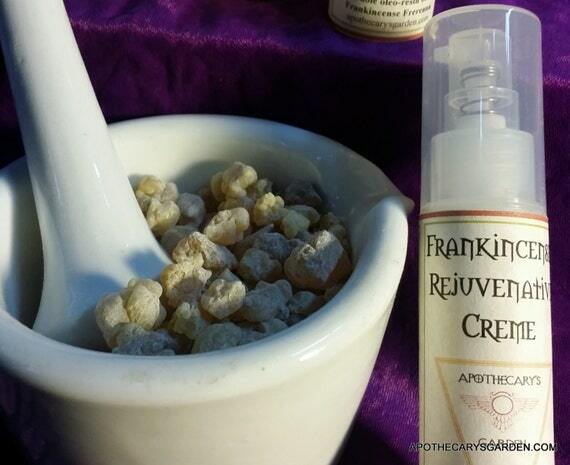 Frankincense has a long and growing list of therapeutic applications. Coupled with ongoing research and investigation of new and promising compounds such as the Boswellic acids, Incensole and Incensole acetate, this list will likely continue growing into the foreseeable future. A medicated oil, in this case, a solution of the extract of Frankincense oleoresin dissolved in a vegetable oil, makes an excellent vehicle for Frankincense’s most valuable therapeutic compounds. It has some advantages over a powdered extract and an alcoholic tincture because it can be applied topically directly to the skin and is easily incorporated into salves and cremes. Though it can be taken internally and is readily digested and assimilated, taking powdered Frankincense is likely a better way to get all the therapeutic compounds into our bodies. I personally take 1/2 to 1 level teaspoon of powdered Frankincense 3-5 times a day, washed down with water when I feel the need. I use an oil extract/infusion of Frankincense forexternal applications only. In Ayurveda, the traditional Indian medical system, Frankincense Serrata has been used in formulas for hundreds of years to address a wide range of diseases and health issues. Though not as well documented, Frankincense also has a long history of traditional use in Africa, the Arabian peninsula, Asia and is a staple of TCM, or Traditional Chinese Medicine where it is referred to as “Ru Xiang”. Arthritis, Osteo and Rheumatoid arthritis, Asthma, coughs, colds and congestion, inflammation of joints, inflammation of the bowels, ulcerative colitis, peptic ulcers and Crohn’s disease, inflammations, irritations and infections of the urinary tract, halitosis, and oral issues. Frankincense is a traditional ingredient in beauty products, skin, face and eye cremes, helps moisturize the skin, is believed to increase its elasticity and promote a more a youthful look. Frankincense is also used traditionally to increase memory and brain function, raise the spirits, reduce feelings of anxiety and depression, as an aphrodisiac, to restore sexual vitality, increase sperm count and address fertility issues. Lately, it has become popular in the west as a “Home remedy” for age spots, skin tags, moles and is thought to help in the treatment of various types of skin cancer. Frankincense is anti-inflammatory, its Boswellic acids are considered NSAIDS or Non-Steroidal Anti-inflammatory Drugs, showing promise in the treatment of many chronic inflammatory conditions without the side effects associated with steroids. Recent research has shown great promise in the laboratory for the use of Frankincense and Boswellic acids in selectively killing cancer cells while leaving healthy cells intact and generating no substantial side effects. Some cancers that Frankincense shows effectiveness combating include ovarian cancer, prostate cancer, bladder, liver, colon cancer and leukemia, while other studies have shown its effectiveness in reducing the size of brain tumors, reducing swelling and inflammations of the brain due to trauma or stroke. It is important to keep in mind that many of these studies are still in-vitro preliminary studies in the laboratory and not clinical trials tested on humans. See the link at bottom of this post for some research and references to the therapeutic effects of Boswellic acids. Separation of Frankincense Papyrifera into its 3 components. Not presented here in their naturally occurring proportions are-resin dissolved in oil on the left, gum dissolved in water on the right and essential oil center stage. The essential oil of Frankincense, as with most other oleoresins, only contains a small portion of the healing compounds the tree offers us. Though essential oils are very concentrated, they contain only the volatile compounds that evaporate at up to 100 degrees centigrade, the boiling point of water. All the heavier compounds which make up the Frankincense resin do not distil over with the essential oils except in trace amounts. This includes all the Boswellic acids and the much-studied AKBA or Acetyl-Keto-Boswellic-Acid. The essential oils make up from 1%-10% of the raw Frankincense oleo gum resin, the rest is composed of approximately 30% water-soluble gum and 60%+ resin, comprised mainly of Boswellic acids. To be perfectly clear, the essential oil of any type of Frankincense contains only a small portion of its healing properties and does not contain Boswellic acids in any substantial quantity. By using the whole raw oleo-gum-resin. Extracting the resin portion with solvents. Extracting/isolating the resin and essential oil by removing the water-soluble gum. Though the water-soluble portion of Frankincense is used in traditional Arabian and Iranian medicine, and likely has its own important healing compounds, they are not yet as well known, well researched, popular or understood. Water bath with multiple vessels and ingredients warming to the same temperature. 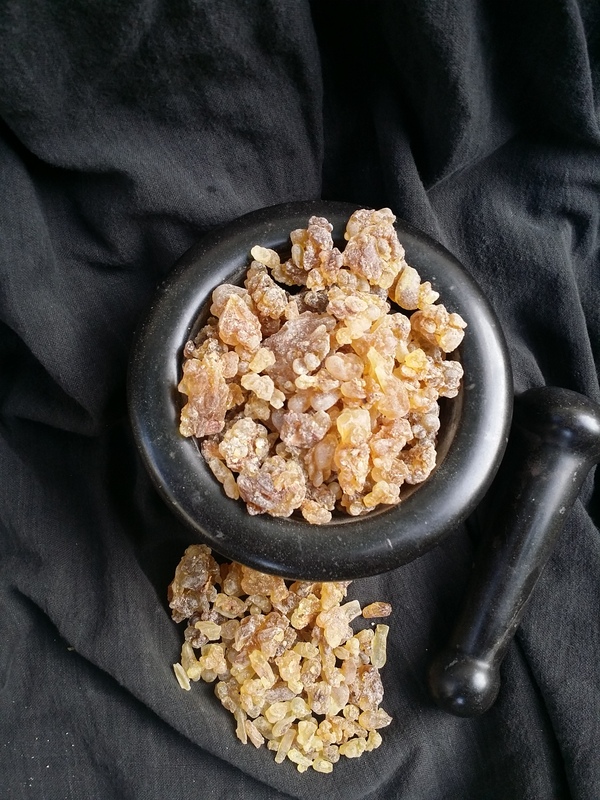 In the preceding post, I shared instructions on how to use water to extract or isolate the resin/Boswellic acids and essential oil from Frankincense oleo gum resins. To date, the Boswellic acids have been confirmed in 3 of the 6 main types of Frankincense on the market. Boswellia Serrata from India, B. Papyrifera from Ethiopia, Eritrea and Sudan, and B. Sacra/Carterii from Somalia and Arabia. Solid at room temperature the resin portions of Boswellia Sacra/Carterii beneath that of B. Papyrifera do not distil over with the essential oils. This is the residence of the Boswellic acids. 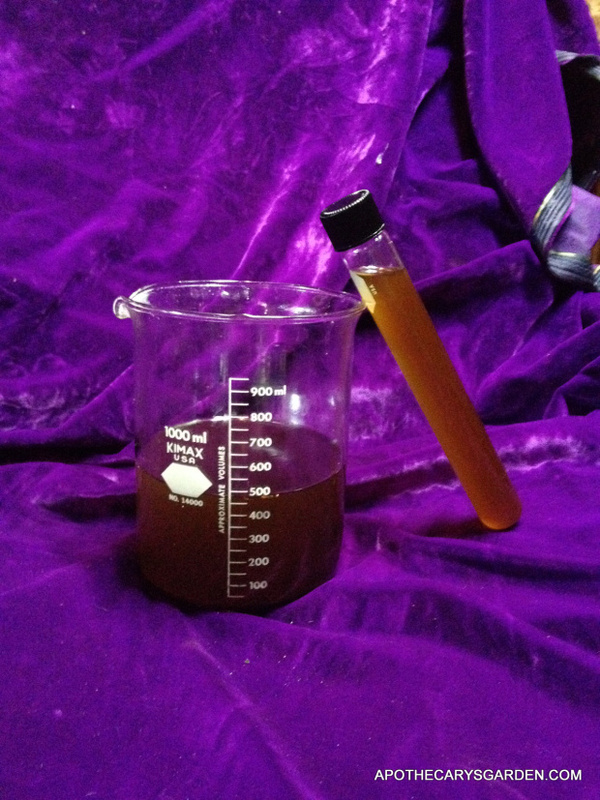 Here then are the best methods I have found, mainly through trial and error, to make a medicated oil from a Frankincense resin or oleo-resin extract.This solution of Frankincense oleoresin in oil can be used as it is or as a therapeutic component in a salve or creme. In one jar place the extract of Frankincense resin, Note that the same process of dissolving oleoresins also works well dissolving Pine, Spruce and Fir oleoresins in oil since they have no water-soluble gum and can be dissolved in the warm oil straight from the tree. Frankincense Frereana from Somalia can also be dissolved as a raw oleoresin in the oil since it’s water soluble gum portion is usually minute and does not interfere in this process. Using the oil of your choice, measure 5 to 10 times the weight of the resin extract you are using and place it in the second jar. I use extra virgin cold pressed olive oil and it works well for me. I have not tested the process with other oils except Jojoba which also dissolves the resin readily. A 1:2 ratio of resin extract to oil will give you a very thick solution, more difficult to work with. I personally prefer a 1:5 ratio of oil to resin extract and find it works well. One can use a ratio of up to 1:10 and still expect an effective medicine. Bring the water in the bath to a boil. The resin will start to soften and slump at about 60-70 degrees centigrade. 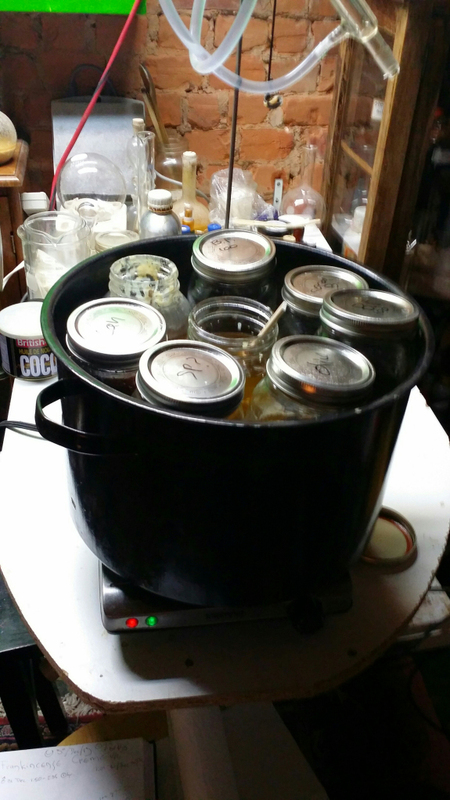 Wait till the resin gets as soft and as mobile as it’s going to get and let both jars reach and sit at their maximum temperature a few minutes. Occasional stirring helps disperse the warmer material and speed up the process. (Make sure the level of the hot bath water is a bit above the level of the oil and the resin in your jars to guarantee they are heated through evenly). You can use a digital thermometer to accurately measure their respective temperatures, or “eyeball it” and leave them in the hot water a little longer to assure they are evenly heated. Loosely covering the jars also seems to facilitate even heating of the materials. Pour or transfer a very small amount of the hot oil into the hot resin, (about a teaspoon to a tablespoon), and stir it into the resin till the resin is evenly diluted by the oil. When it looks like the resin is thinner and more liquid and not clumping or layering with the oil, add a bit more oil to the resin, and stir as before till the resin is completely dissolved. If you are pouring the oil directly, make sure no water drips into the resin from the sides of the oil jar while you are pouring. Repeat with increasing quantities of oil till you have added all your oil to the resin. When the oil and the Frankincense resin are homogeneously blended, pour the mix through a fine mesh filter into a clean jar or bottle. A fine metal mesh coffee filter above a funnel works well. If you like you can add a little Vitamin E to preserve the oil from rancidity, but in my experience a high ratio of resin in a vegetable oil preserves it for quite a long time. Remember these oleoresins have been used for thousands of years to embalm, mummify and preserve bodies, some of which are still intact today..
You will be left with a fairly homogenous solution. It will sediment a bit as vegetable oil does not completely dissolve all the components of the resin. 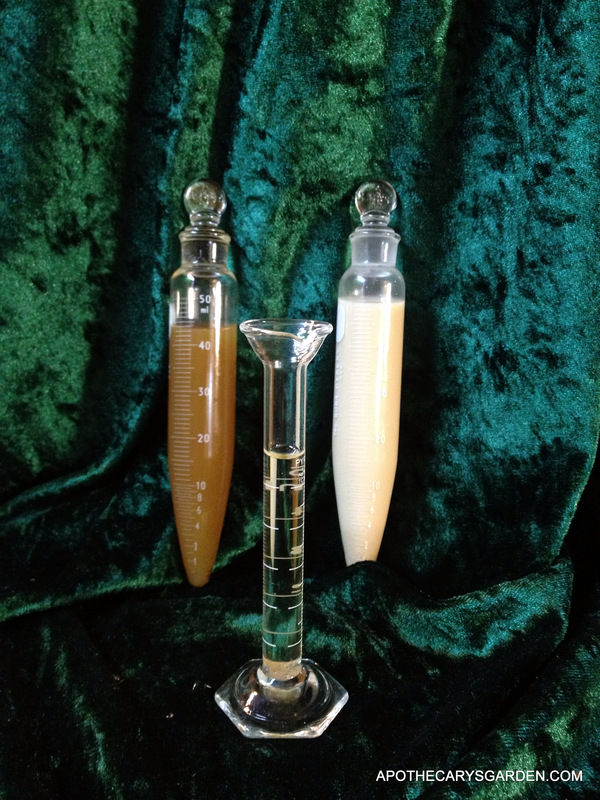 I find this sedimentation does not interfere with any of the products I make with the oil. When making a salve or creme I stir it well and find it blends well with both. To create a complete dissolution of resin, one must use harsher solvents which I like to avoid. A little sedimentation seems a small price to pay for a more natural product. If you pour all your oil in at the same time. If you pour the resin into the oil. Also-Never use a microwave for this process or heat the materials directly on the stovetop without a waterbath. Your oil is now ready to use as-is or added to a compound product such as a salve or a creme, following any recipe you are used to or one of many from the internet. All Frankincense and Myrrh types are in fact oleo-gum-resins because they all contain oleo or volatile oils, also called essential oils, they all contain resin, made up mostly of terpenes and resin acids. And they all contain water soluble gum, made up mainly of polysacharrides containing a bitter principle. When we wash away the water soluble gum, we are left with the pure oleoresin, or resin and essential oil. This is now a true oleoresin. If we evaporate or otherwise remove the essential oils we will be left with a resin. Both resin and volatile oils are soluble in oils, the gum is soluble in water and is not soluble in oil. Pine, Spruce and Fir trees bear true oleoresins because they contain only resin and volatile oils and no water-soluble gum. For this reason they will dissolve readily into warm oils with no extra processing or extraction required. Though they are sometimes called saps, these fragrant materials are produced by special ducts beneath the outer bark in response to injuries, and are not really the sap of the tree which collects and delivers nutrients throughout the tree and is accessed through tapping the tree deeply. Here is a link with a good overview of Frankincense and Boswellic acids. Though this is only one study, it covers many of the therapeutic properties and applications of Boswellic acids and provides links to quite a few studies on the subject. It is written with regard to Boswellia Serrata, but it is equally applicable to both Boswellia Papyrifera and Boswellia Sacra/Carterii, since all three species have been proven to share similar chemistry and content of Boswellic acids and Incensole. Makes for an educational and informative read. Enjoy! Feel free to post any questions you have in the comment section below. And remember to always take clear notes..